After opening act The Deslondes finished their set and we stood waiting in the waning sun, a guy approached a couple nearby and said to the man, "That's a mighty fine flannel you've got there." The man said it wasn't actually flannel, but I poly-cotton blend. But it was the in the stranger was looking for. He then launched into a long monologue about his recent travels and current layover in Bend. As the wait stretched on, and day turned to night, the beer kept flowing and the crowd packed into the outdoor courtyard between Volcanic Theatre Pub and Goodlife Brewing. About an hour later, Old Crow Medicine Show finally took the stage. Band leader Ketch Secor attributed the delay to a blown generator in his pre-show spiel. And, indeed, a few songs in, the band had to forgo its fancy stage lighting in favor of a simpler two spotlight aesthetic. He joked that they were going "green"—fitting since they were playing in Oregon. The Americana outfit played a number of tracks from its recently released album, Remedy, including its second collaboration with folk icon Bob Dylan, "Sweet Amarillo." Between the songs, Secor spun a yarn similar to that of the traveling stranger, tying the songs' themes to his vision of life in Central Oregon. An approach that oscillated between endearing and relatable and contrived and pandering. Still, his charisma carried, and it was easy to imagine him as snake oil salesman, slinging salves and wooing women as he makes his way across the dusty country. But any lack of authenticity in the banter was remedied by the band's infectious energy and undeniable musicality. 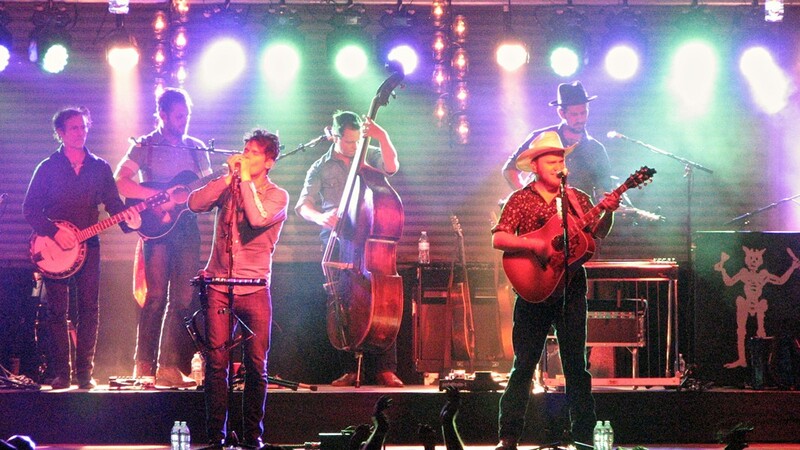 From ballads to high tempo numbers to covers featuring the Grateful Dead and hints of "This Land Is Your Land," Old Crow Medicine Show gave the audience the succor it needed. By the time they got around to their best known, oft-covered track, "Wagonwheel," the crowd was swooning and, of course, singing along. It was a warm end to a cathartic evening. Check out photos from the show in the slideshow.